the lift ware spoon | Abler. 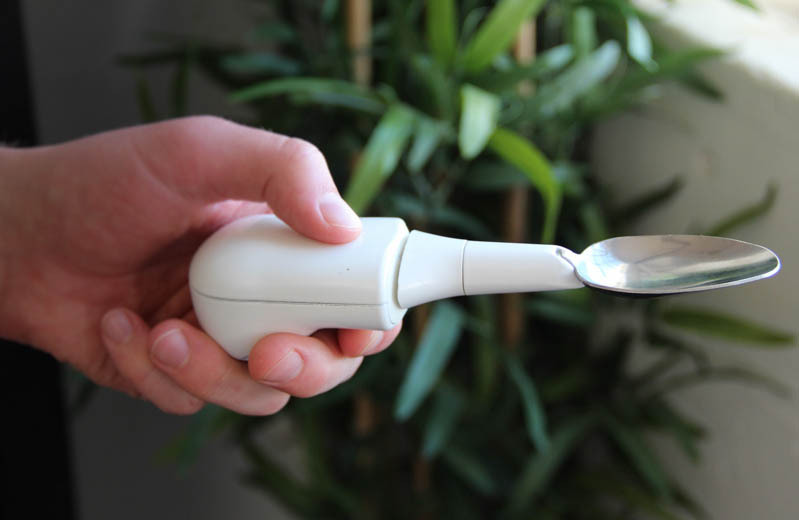 A technology editor at The Atlantic asked me to comment for their story on the Lift Ware spoon, a piece of sensing cutlery that eliminates up to 70% of a user’s hand tremor effect, making a smoother and easier passage from plate to mouth. The tool is bifurcated in the middle, so the back end can receive, sense, and respond to tremor, while the front end is stabilized. In a sense, all technologies are “assistive” technologies — eating hot soup with one’s bare hands does not sound particularly effective, nor pleasant. We have invented spoons to extend our limited abilities. I’m glad they agree that all tech is assistive tech. Video below, demonstrating several users with hand tremors struggling with typical spoons, and then with the Lift Ware model, which seems to show a lot of improvement. Where are these Liftware spoons available? This is humanity! We care about people with Essential Tremor or Parkinson’s Disease! I love it! BUT WHERE CAN WE BUY IT, I CAN NOT TAKE, THIS TOO MUCH FOR ME.